You're playing a shooter. Some Marine stands in front of you, barking out commands. Whatever he's saying doesn't really matter—it translates to little more than "shoot the bad guys!" Eventually, he steps out of the way, you run forward, and you dash through narrow corridors, using a host of weapons that more or less function exactly the same. In the modern military shooter, nothing you do really matters. Oh, sure, there have been digressions like Call of Duty: Black Ops II, where decision points can change the final cutscene in a game, but in the actual moment-to-moment gameplay, you do the exact same thing, over and over and over again. Nothing changes, you remain largely untested, and the game itself ends up being, well, boring. Fortunately, shooters don't have to be boring. 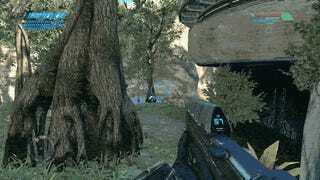 Soon to see its third re-release, Halo: Combat Evolved remains not only one of the best shooters ever made, but also one of the best video games. That's a pretty big claim to make, but Halo's got the levels to back it up. Of all the levels in the game, The Silent Cartographer feels like a vertical slice of every element that makes Halo, well, Halo. How do all these elements work together to make a good shooter? After all, we live in a post-Halo world. Surely in the 13 years since its release, shooters have evolved and we've got better shooters to choose from, right? Let's walk through the level and see. 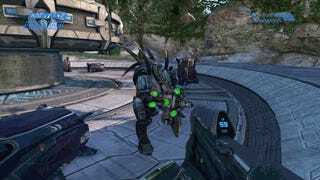 The Silent Cartographer begins with a beach assault—the humans have regrouped and are finally on the offense against the alien Covenant that stranded them on Halo. They're looking for a map room called "The Silent Cartographer," which will lead them to Halo's control room. They don't know where it is, other than that it's on the island. "Touchdown. Hit it, Marines!" yells Foehammer, your pilot, and you come out swinging. Right away, development studio Bungie's great level design is apparent. The enemies are too far away to hit effectively with your MA5B assault rifle, which seems like bad level design until you realize that it's giving you a reason to commit to a heroic charge up the beach and leap right into the fray. The combat arena in Halo is a dance floor, and the short range of your assault rifle is an invitation to get up there and dance your heart out. The great secret about first person shooters is that shooting is secondary—heck, it's right there in the name: first person shooter. The first-person perspective is paramount and benefits from motion. 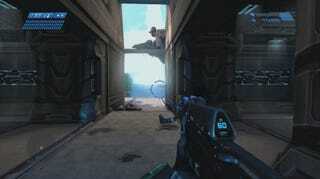 Playing an FPS is all about moving about and navigating a space. Long before you're even considering clicking on guys until they die, you should be thinking about the space you're moving in. Halo quickly entices you right into the fray. Halo has, for lack of a better word, a dance. There's a specific rhythm, a unique cadence to Halo's combat encounters missing from a lot of games. The combat arena in Halo is a dance floor, and the short range of your assault rifle is an invitation to get up there and dance your heart out. So you do. You're Master Chief, the best of the best. You charge in and the gaggle of grunts is running around, trying to hide or flank and shoot you. The Elite enemy cares less about getting hit, but he'll still roll around, occasionally getting close enough to try to punch you. You, for your part, can get nice and close and sock it to him, but if your shields are low, it's advisable to back up and try again. Speaking of shields, Halo: Combat Evolved's approach to health is great. A traditional health system would discourage most players from trying to engage an Elite in a fisticuffs, because health loss is guaranteed. With the shield system, the health loss is only a possibility. You'll lose some shield energy when you take a hit, but you'll only lose a bar of health if you allow the shield to be depleted and fail to find a safe spot so that the shield can recharge. The health system is another invitation to dance, a calculated risk rather than a guarantee. In a modern military shooter, if someone shoots at you, chances are, you won't be dodging. Their weapons are 'hitscan,' which means that when your opponent fires a gun, the game checks to see if anything is in the way. If it is, the hit is immediate; there's no projectile travel time, which means there's no way you can dodge because there's nothing to dodge. The game merely says "is there someone there?" and if the answer is yes, it's an automatic hit. In Halo, not only can you tell that someone's shooting at you and where from, but each Covenant weapon has a distinct firing behavior and a unique visual signature to accompany that. The quick, blue fire of a plasma rifle is quite different than the slow, semi-tracking arc of green fire from the plasma pistol alt fire mode, while the lazy, bright pink needler projectiles are completely different. When a member of the Covenant shoots at you, you'll always know how to dodge it. Being able to dodge an attack is just another part of the dance. So you take 'em out, and a pair of elites accompanied by some jackals—an even tougher mix—brings the dance to a climax, but it's all over soon. After all, you're accompanied by a bunch of heavily-armed Marines. Foehammer returns, this time with a Warthog. The island you're on is large—it would take too long to run around. Some marines hop in with you, but where to go? If this were a modern military shooter, you'd have a map marker. This isn't. It's Halo. You could drive wherever you want, though the Warthog's pointing towards an inviting bend in the beach. There's no map marker, just a question: what's around the corner? Driving ahead, you'll run into some Jackals, Grunts, and an Elite, but it's nothing major. One of Combat Evolved's scripted sequences comes into play here: a Covenant dropship has arrived just ahead of you. Covenant forces appear to be securing the area. It's a simple scripted sequence, but that's what makes it so great. In Halo, enemies inhabit spaces—they walk around, ready at any moment for enemies to strike. Attacking them feels like interrupting them, stopping something important. This particular fight is a perfect opportunity to see what your Warthog can really do. Dispatching the enemies in an intense firefight is fun, but heading into the structure alone, you'll quickly come across some Covenant forces that would rather die than let you any further—you defeat them, but they lock the door. Cortana, the AI companion in your suit of armor, informs you of a security system that can unlock the door, but it's somewhere else on the island, so you head back to the Warthog. You could go back the way you came, but a cool rock arch in the distance looks like a more interesting landmark. Go through it, and you'll find a hill directly in front of you. I don't know about you, but most people I know who play this game see that ramp shape and feel like they have to jump it. Once again, the game's interesting geography pulls you on, only this time, when you jump, you land amidst a group of Covenant forces. Yeah, about a dozen Covenant units were hiding there. You drive out of there quickly, whirl around and let your gunners take out the forces. It looks like these Covenant forces have killed some Marines, which explains why they were milling around here—while sad, it's a great time to rearm. If you continue in the Warthog, you'll see a structure on top of the cliff, and Cortana will tell you that you've missed something. Head back to the site of your previous fight, and sure enough, you'll find a path leading up into the cliffs. It's populated by a breadcrumb trail of Grunts, Jackals, and Elites. Get to the top of the pathway, and you'll find an area that opens up to the right, but straight ahead? More Marine corpses with ammo and health kits! …But… you've also got a new Covenant enemy to contend with: Hunters. They're big, meaty brutes with huge plasma cannons. Oh, and they've got lots of armor, so good luck taking 'em out, even with a full clip. Hunters don't just use their easily-dodged plasma cannons either—they're more than content to get close and beat you down. Oh, and they've got a weak spot on their back, meaning it's advantageous to dodge, flank, and shoot. That dance you've done before? It's just changed again. One mark of a bad first-person shooter is that it's got bullet sponges for enemies. A bullet sponge is a boring enemy that can absorb a great deal of damage. Hunters can absorb a great deal of damage, but they're not boring. A bad bullet sponge enemy often has an attack that can't be dodged, whether because it's an area of effect attack or because it comes from a hitscan weapon. A good enemy has attacks that can be dodged and encourages you to dodge quite a bit. It's all about the dance—it's all about moving you throughout the space. In Halo, enemies inhabit spaces—they walk around, ready at any moment for enemies to strike. Attacking them feels like interrupting them, stopping something important. Okay, so, if there's one problem with the remake of this level in Combat Evolved Anniversary, it's that the game has too much detail. The dead space Marines I mentioned earlier? In the updated version of the game, the grass actually hides them and their supply of goodies. The breadcrumbs that exist to bring you out into a combat space becomes hidden, encouraging caution. Before, it was all "hey, I should go there and pick up that a health pack—OH NO! HUNTERS!" Now, it's like "woah, this is a pretty big space, I wonder if there are any enemies in it?" There's a flattening of the experience that goes on in the HD update. Before, it was elation followed by terror. Now it's just caution. For a game that's so much about clear communication, Halo's Anniversary visuals occasionally do more harm than good. Design students are quickly taught the value of white space—empty space on a page that's used to guide the eye around, or just plain make stuff look good. Beginners will often take blank space and jam as much content into it as they possibly can, but the more info, the more distracting everything gets, and the more boring it becomes. White space makes a work 'pop,' and Combat Evolved Anniversary, while pretty, suffers from an excess of detail that works against the simplicity of the original's visuals. With the original Halo, Bungie understood the importance of clear communication. Enemies look unique and behave differently. Their weapons have distinct colors and behaviors to help mix things up. When you take down an Elite's shields, there's a bright flash and electrical static that shows they can be easily dispatched. As a Grunt dies, it may fire a few more rounds. Grenades cast off a light that makes them easy to spot. A Jackal's shield will change color as it takes damage, eventually exploding in a flash of light. Anniversary enhances this in some respects, and mutes it in others—Hunter weapons don't glow quite as much as they did previously. Nevertheless, Halo always telegraphs what's coming next or what's possible next, making combat as clear and as fun as possible. The Hunter fight quickly ends, and players are drawn to yet another arena with more Covenant forces. In case it wasn't clear where to go, some enemies emerge from a tiny opening in the arena, drawing you around to the structure you saw previously. Going inside, we take on more Hunters, make our way to a control panel, and unlock the door. Unfortunately, we also hear on the radio that a Pelican has crashed, and we head back outside, where we're met by a new enemy: invisible Elites. How we tackle them, again, brings us to a new combat dance, but they are quickly dispatched, and we head outside to find the wreckage of a Pelican where we're rewarded with a rocket launcher. The next Hunters we face will be going down quick. A Warthog is in the wreckage too, so we can hop in. We had left the other Warthog prior to the first Hunters. We continue on around the island, where we find the beach assault site from before. The leftover Marines are more than happy to fill the new warthog. Head back to the locked door, and you can head deeper into the heart of Halo. Up to this point, The Silent Cartographer has been all slopes and cliffs. Now you're in a series of vertical rooms—fights become far more vertical than they had been previously. Verticality, a new kind of engagement, has been added to the mix. Unfortunately, this is The Silent Cartographer's weakest moment. To progress, you'll need to enter one of two different doors (they lead to the same place), but they're kinda hard to spot, especially with the cluttered art from Anniversary. Beyond that, it's great. Marine corpses help draw you around the map, as do more Covenant to kill and the occasional power-up. As you progress into the Halo ring, the Marines begin radioing that they need support—you're tasked with proceeding on the mission. Unfortunately, there's nothing you can do to save them. Find the Cartographer, activate it, and fight your way back out onto the island's sunny beaches. The Silent Cartographer is almost over. Stick a grenade on the sword-wielding Elite or shoot him in the face while keeping at a distance. Or do whatever you feel like with him, take down some invisible Elites sent to back him up, and it's time to get on your Pelican and go. It's a nice climax and denouement at the end of a level rife with tense firefights. The level is superb. There's a constant sense that you're making progress as you play through the level. You move quickly from point A to point B to point C. When enemies die, you're treated to light shows as their shields crackle and pop. Kill an Elite, and you'll frighten the grunts. Kill one hunter, and the other goes berserk. When you shoot someone, Halo's fantastic physics system makes them feel like you really shot them. Aliens practically fly when you toss grenades at them. Everything you do in Halo is accompanied by the sensation that you've had a real impact on your environment, sometimes literally. When you begin The Silent Cartographer, you're drawn into a firefight because of your gun's lack of range and accuracy. The enemies move you around the arena. Their weapons pull you onward. The level design, rather than simply saying "okay, go there," engenders curiosity, encouraging you forward. One of the ways Halo maintains the sensation of progress is through generous checkpointing. Rarely do you die anywhere that robs you of more than five or 10 minutes of play. You're always moving forward; you're a shark. As Master Chief, we players feel empowered as we fight through hordes of terrifying enemies, but at the same time, we find ourselves vulnerable. Throughout much of the level, it's just you. Many modern military games have you fighting alongside other soldiers. Halo frequently places you by yourself—you're vulnerable, but when you overcome the odds, it's you and you alone who did it. It's an emotional ride. In games where you're one of many people, the experience feels flattened. It feels like it's missing the highs and lows of a well-shaped, differently-paced, emotionally-charged series of encounters. When a game is flat, it's boring. Halo isn't a flat game. It has shape and texture in everything from the visual design to the way you engage with the game space to the way you feel as you play through it, so long as you're receptive to what's being presented. That's The Silent Cartographer. 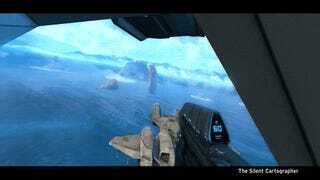 That's Halo: Combat Evolved. It's not flat. If there's one lesson to learn from Halo, it's this: the best shooters are the most engaging ones. They're the games that keep you on your toes, that provide constant feedback to your actions, that invite you to show your moves on the dance floor. Shooters aren't games about pointing and clicking on things. They're games about engagement. When you begin The Silent Cartographer, you're drawn into a firefight because of your gun's lack of range and accuracy. The enemies move you around the arena. Their weapons pull you onward. The level design, rather than simply saying "okay, go there," engenders curiosity, encouraging you forward. The best shooters give you such a dynamic experience, from enemy action to physics simulations, that no matter how much you replay, you can always do something differently, and diverse enemies and engaging environments is a big part of how that works. With Halo, you're constantly engaged in a space. Everything you see or hear inspires you to move, to shoot, to act. It doesn't give you a health system that encourages you to stand still and take pot shots. It doesn't provide you with objective markers that discourage exploration. It doesn't give you bland weapons and enemies that ensure you're always going to end fights the same way. Halo proves that shooters don't have to be Groundhog Day. Bungie's next game, Destiny, seems pretty cool—the beta was a blast, after all. A few months after, 343 Industries will be releasing a collection of Halo games, including the original Halo, for the Xbox One. 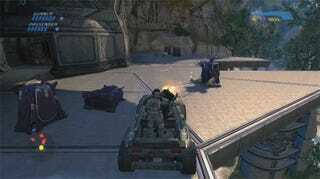 If you've never played Halo: Combat Evolved, I hope you will. It's a great game. Editor's Note: This article originally was headlined: The Unusual Excellence Of Halo's Best Level, but the author would like to stress that it is the most iconic one—the one that most effectively presents what Halo is—but that, while it's among the best levels, there may be even better ones.